BeConsulting is able to provide you with an innovative solution that solves your overseas employee issues. How? BeConsulting, an association of academic and industry experts, are able to provide you with a unique service that integrates expertise in the specialist areas of Immigration with Human Resource, Industrial Relations and Employment Law..
Our objective here is to provide you with a brief overview of the different visa options available for your current / prospective overseas employee. However, if you would like information that is specific to your needs, please complete the enquiry form below and one of our consultants will contact you to discuss your matter personally. As a business owner or manager you will appreciate that employees can be a means towards competitive advantage that makes the difference between success and failure. Why then would you put all your eggs in one basket by only considering a provider with one specialist service – Immigration knowledge? 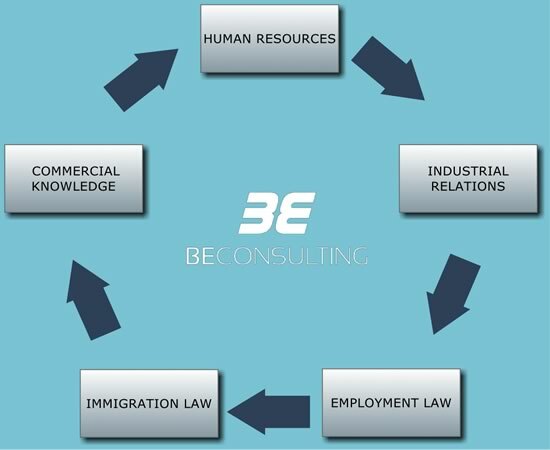 At BeConsulting, our mix of professionals in all areas of the industry are able to offer a total employment solution to your organization, through the integration of: Immigration law, Industrial Relations / Employment law and Human Resources expertise. Our service offering differentiates us from most other Immigration providers. Our capacity to effectively deliver a total employment solution to our clients is based on the caliber and professionalism of our consultants. All you need to do is to spend a few minutes and have a look at our consultants education and work history to make such a conclusion for yourself. About Our Team. You will quickly see that we have done far more than a simple graduate certificate in Immigration law – we are highly qualified and experienced professionals in every sense of the word. Temporary workers visas are for individuals who are sponsored from their destination of origin by an Australian employer. This visa option allows local employers to use international employees for a specific period (3 months – 4 years) upon satisfying the requirement for the visa. The 457 process is requires considerable knowledge of the laws and regulations relating to Immigration and Employment in Australia. . For example, it is often the case that a 457 visa application must be referenced against a relevant modern award or industrial instrument (enterprise agreement). There are times when it is unclear which modern award may or may apply to a workplace or a particular individual in the workplace. BeConsulting through its mix of professionals, has the knowledge, skills and ability to provide you with an effective service. If you would like up to date information relating to the 457 visa, please complete the enquiry form. Employer nominated visas are proven to provide organizations with a greater capacity to attract highly skilled workers as compared to a 457 visa. Ability to offer the foreign worker a full time offer of employment for a period of two years. With respect to the applicant, the applicant must be less than 45 years of age (unless exceptional circumstances are displayed), have strong English as well as having minimum educational requirements. What is your employment brand? What is your organisations culture like? Does a specific applicant fit into your organisational culture? Is the new employees’ position description appropriate for the actual position? Is your performance management system appropriate for your organization? How are you going to protect your organisation from a potential unfair dismissal claim? Recruiting an employee is the easy part, retaining the right employee and motivating them to produce the best results is the hard part. BeConsulting has the knowledge, experience and expertise to make your organisations foreign worker experience a positive one for your organisation.